However, sometimes people like to mix and match tow bar manufacture part for whatever the reason. So, if you have a Blue Ox Tow Bar and find yourself buying a used Honda CRV with a Roadmaster Base Plate already on it.... This is your page to find the adapter you'll need! Our shipping calculator sometimes goes off a little strong, if you are placing an order under $100 and think the shipping is too high.... Call us for a review and better deal! 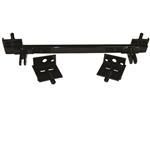 Adapter Bar - Sterling tow bars with serial numbers above 14,501 to Blue Ox brackets.